A trust can be designed to bring you and your family peace of mind. Whether you want to provide for grandchildren, endow a charity, or provide for the special needs of a loved one, a trust offers a flexible planning method, written to your specific concerns and priorities, to address your most personal family matters. Caldwell Trust Company exists to provide personal, traditional and independent trust services. Our team offers a full range of integrated services, tailored to your individual priorities, to help you enhance and protect your legacy for generations to come. Having a trust in place and organizing your estate gives you the peace of mind that everything is taken care of. 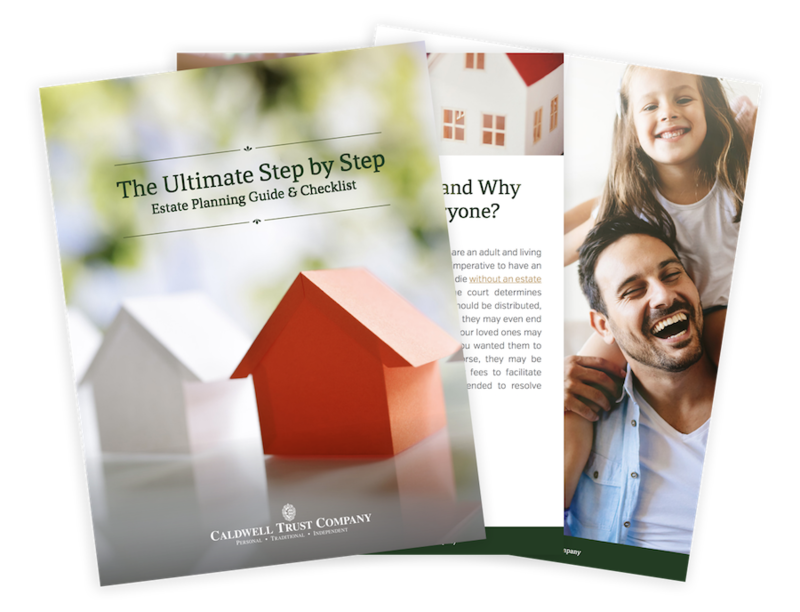 All of your information and assets are organized so you can continue to plan for your future and give your family all the details they need. Creating your legacy is important business. It requires thoughtful strategies that protect your wealth and transfer it as you intend. At Caldwell Trust Company, there are few challenges we haven’t met and helped resolve. We manage complex wealth matters drawing on the breadth and depth of our experience, knowledge of current tax laws, and a commitment to the highest fiduciary standards. Settling an estate demands time, knowledge, and attention to detail to meet all of the legal requirements necessary to carry out the terms of your Last Will and Testament. Naming Caldwell Trust Company as Personal Representative ensures the settlement of your estate will be handled by experienced, accountable, impartial experts. Most importantly, we offer the highest degree of sensitivity to your loved ones, bringing them peace of mind at this most difficult time. We bring experience in handling all kinds of assets, investment expertise, an honest and unbiased approach to our responsibilities, and familiarity with legal and tax requirements.